The Fellowship was fortunate enough to obtain a copy of ROBERT JORDAN’S THE WHEEL OF TIME®: THE EYE OF THE WORLD #22 from Dynamite Entertainment. Chuck Dixon scripts, Andie Tong pencils, Nicolas Chapuis colors, and Bill Tortolini letters. 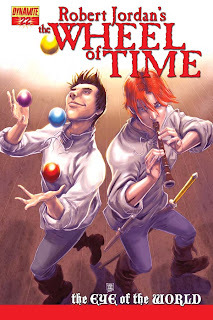 This book is an adaptation of the popular fantasy series by Robert Jordan. We pick up the action with Rand and Mat traveling toward the city of Caemlyn, with no money and food becoming harder to come by. Then they get the idea to work as minstrels in taverns along the way, which works well until they realize that they’re being followed. Having read several of Jordan’s books, the thought of a comics adaptation interested me, and this one doesn’t disappoint. The art is nicely done, with backgrounds that fit the rustic setting well. The scripting also flows well; Mr. Dixon leaves us with a nicely laid cliffhanger here. And I like that they’re taking their time with the story; it would be easy to rush through and miss a lot of Jordan’s legendary detail, but we’re presented here with pages spent in letting us get to know Rand and Mat rather than having them *presto* appear in Caemlyn. This looks like a solid adaptation of a well-loved fantasy series, and it looks like they plan to do it right. I look forward to seeing more. ROBERT JORDAN’S THE WHEEL OF TIME®: THE EYE OF THE WORLD #22 is available now at your FLCS or by order from dynamite.net.